This selection of Time saddles includes the Air Flow (Gel) ladies saddle with Real Leather cover, Titanium rails and Superlight foam and gel insert. 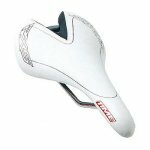 There's also the Time Ul Team Carbon Air Flow Saddle: Top end race saddle, Beautifully hand made. Lorica Cover Carbon fibre shell. Carbon rails. Weight: 120 grams.